Fig. 1 shows the block diagram for the phase shift method of SSB generation . This system is used for the suppression of lower sideband . This system uses two balanced modulators M1 and M2 and two 90o phase shifting networks as shown in fig. 1 . The message signal x(t) is applied to the product modulator M1 and through a 90o phase shifter to the product modulator M2 . at the output of the wideband 90o phase shifter . 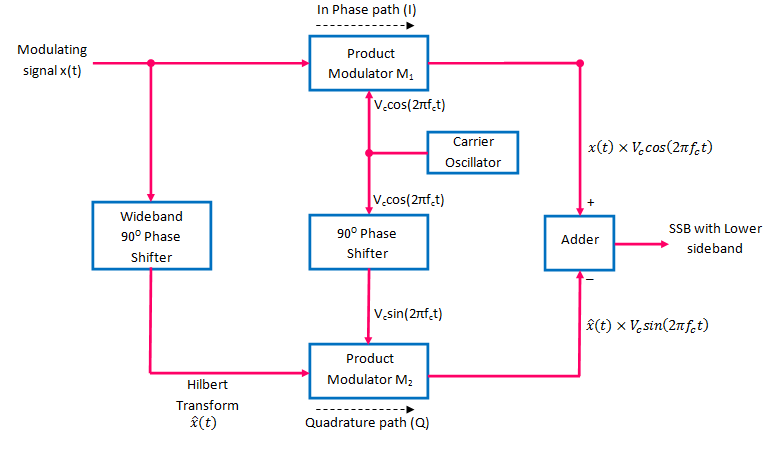 The output of carrier oscillator is applied as it is to modulator M1 whereas it s passed through a 90o phase shifter and applied to the modulator M2 . The outputs of M1 and M2 are applied to an adder . This expression represents the SSB signal with only LSB i.e. it rejects the USB . The block diagram of the phase shift method to generate SSB with LSB is shown in fig. 2 . Note that the adder polarities for the in-phase is positive and for the quadrature paths is negative . We can suppress the LSB and generate the SSB signal consisting of the USB by arranging the blocks as shown in fig. 2 . Here, the modulating and the carrier signals are applied to the upper balanced modulator directly (without any phase shift ) .Whereas, both these signals are 90o phase shifted and then applied to the lower balanced modulator . It can generate the SSB signal at any frequency, so the frequency up converter stage is not required . It can use the low audio frequencies as modulating signal . (In filter method, this is not possible ) . It is easy to switch from one sideband to other . The main drawback is that the design of the 90o phase shfting network for the modulating signal is extremely critical . This network has to provide a correct phase shift of 90o at all the modulating frequencies which is practically difficult to achieve .